Special Offer: Order with anything else and receive a £2 refund. 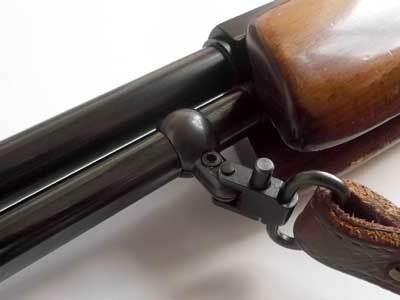 The split barrel band should ideally be fitted from 13 to 17 inches forward from the trigger. To install, firstly degrease the barrel band and the location it will be fitted to. until one or two threads show on the inside. 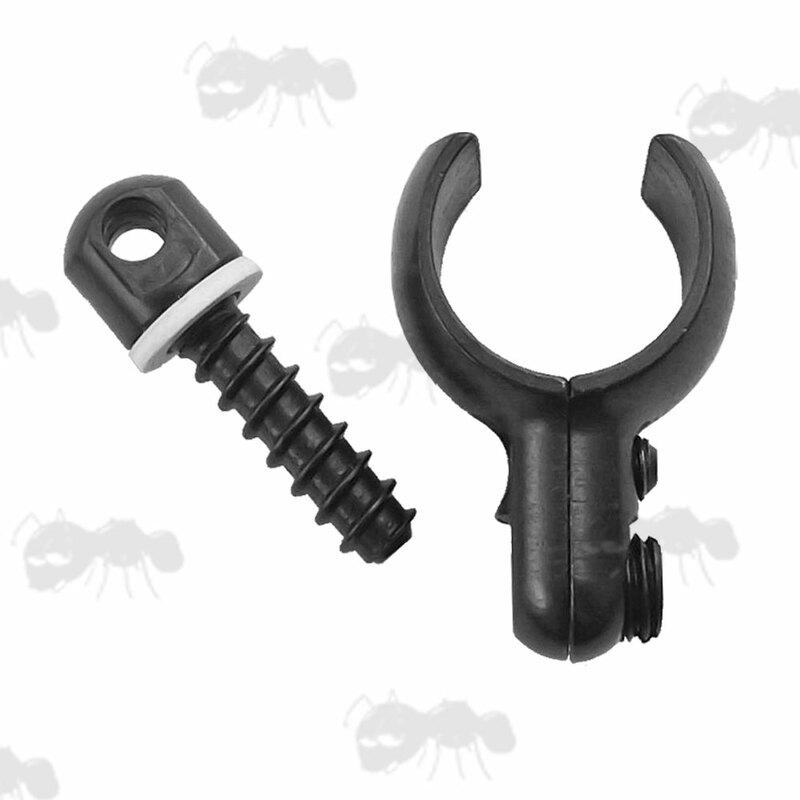 It is hollow as your QD sling swivel fits through it. Place both halves of the band on where they are to be fitted and now screw-in the Allen head screw. Make sure that if there is a gap between the halves, that it is evenly spaced. When secure, the band may be able to rotate if force is applied, for a permanent fixing, adhesive can be used. 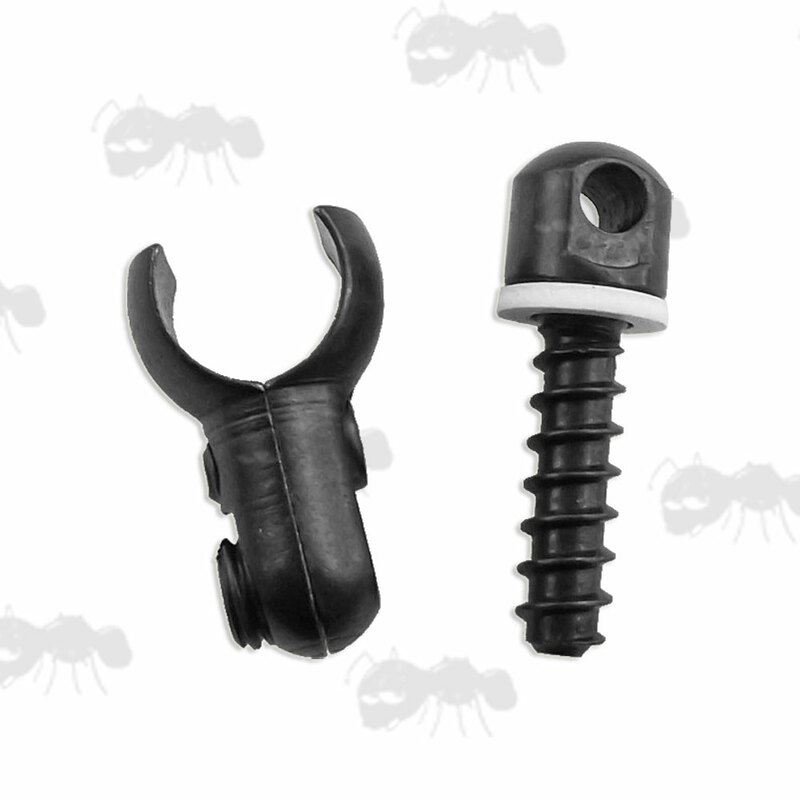 We have received reports of issues with the Allen (Hex) screws that secure the barrel clamps. The heads are being rounded easier than normally expected, possible either due to them or the Allen keys being made from mild steel. 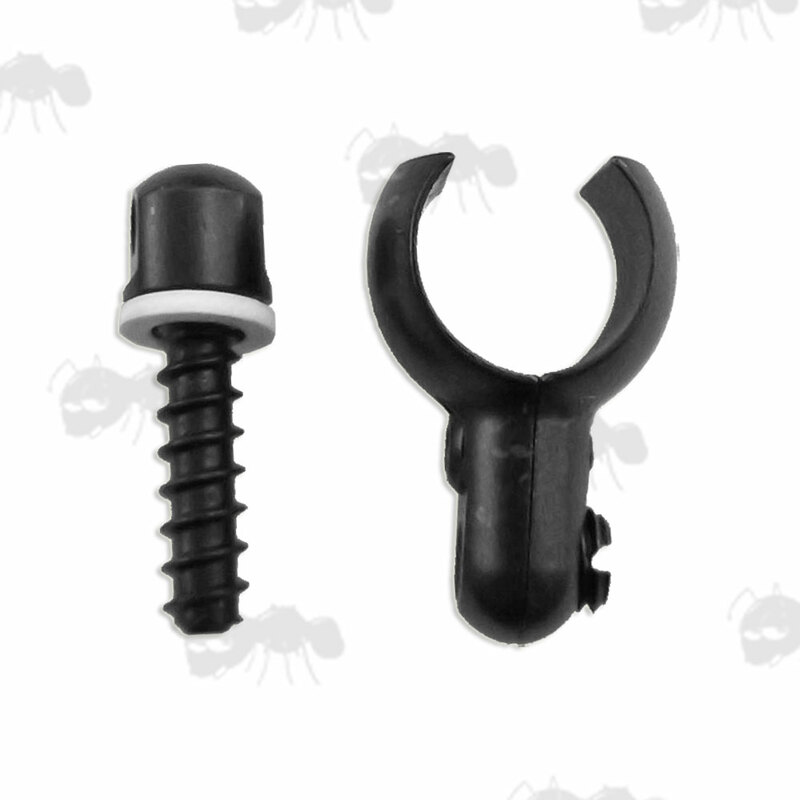 You could swap the Allen screw for a standard one from a scope ring etc, which is then tightened with a 3mm Allen key. The one included is only 2mm so it is easier to round the head. Most Automatic, Bolt action and lever action .22 rifles and carbines. 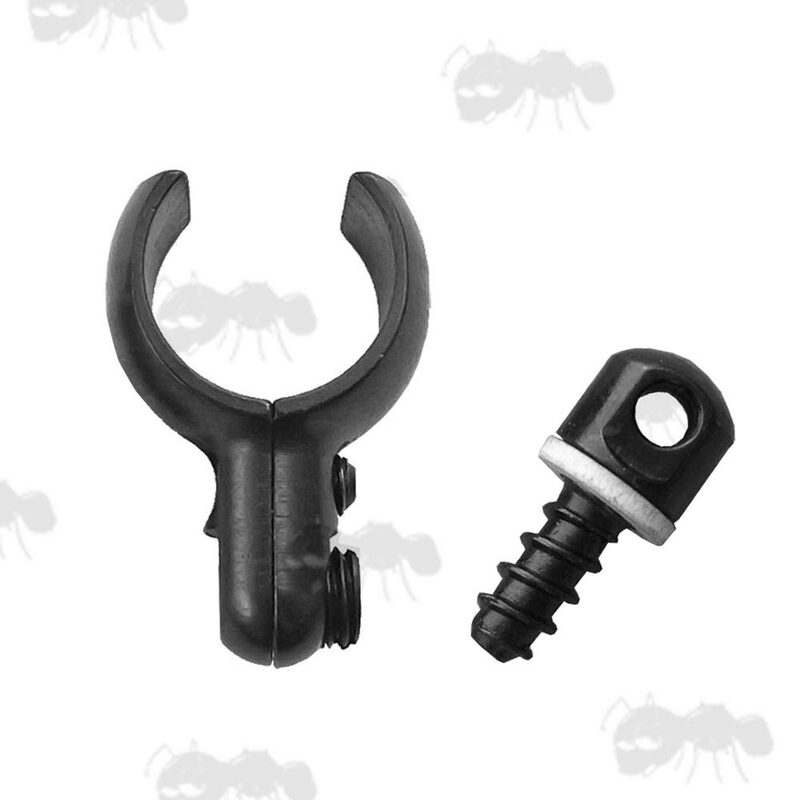 (Although for the TX200 we recommend the Bisley fixed swivels). Beeman Falcon I, Falcon II, 100, C-1, R7, R8. Browning Jonathan Browning Mtn. Rifle. Dynamit Nobel (RWS) RWS 24, 25, 26, 27, 28, 50T.01. Ruger Blued Mini-14, Mini-14/5R Ranch, Mini Thirty. Savage 24 Series: 22LR/410, 24D 22LR/410. SMK DB5 .22 Under Lever. Webley & Scott Bruin, Hawk, Vulcan. Weihrauch HW77, HW90K, HW97 / HW97K, HW977, HW99s. Fitting the underlever on Weihrauch HW77K. For HW80 try the 'Most Airgun Barrels' set or the 12g SINGLE BARREL, the 12g single barrel set should also fit the 22mm HW98 barrel shroud. 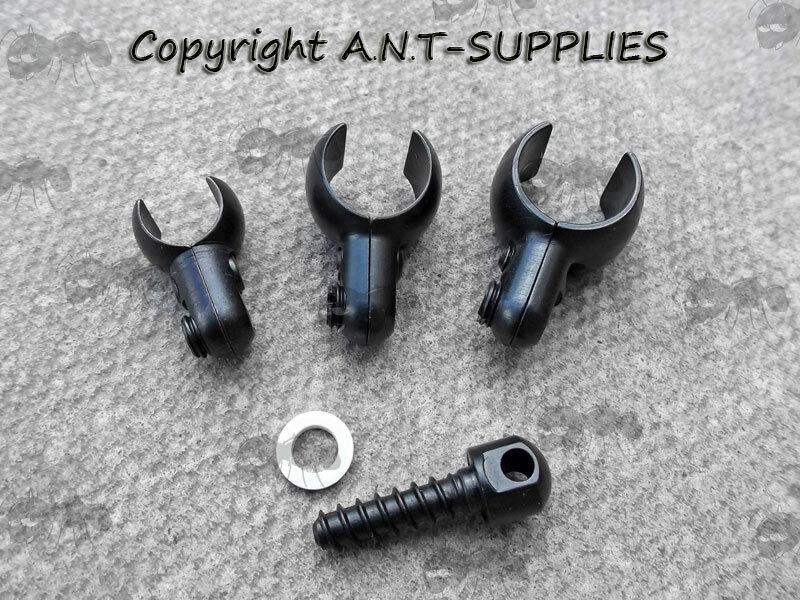 HW97KT .22 - The exact set needed to carry your rifle in the field! For the price of Weihrauch air rifles, they should come equipped with a set installed when you buy. This set will be what you're looking for if you own a Weihrauch. Beeman 200, 250, R1, R5. Diana 350 Magnum .22 cal. Dynamit Nobel (RWS) RWS 34, 35, 36, 38, 45. EI Gamo Cadet, Expo, Expomatic, .22 Cal. Sharp ACE (The barrel is 15.9mm). Walther Terrus airgun (outer barrel is 15mm). Most airguns BSA, Weihrauch HW80, HW95, HK95K, Theoben Evolution (Actual barrel diameter 15mm) etc. Auti ordnance Thompson Sub-machine gun 1927A-1, 1927A-3. Crosman 1, 66, 766, 2100, 2200. Daisy 880, 881 917, 922, 977, 1894. Dynamit nobel (RWS) 85 O/U double rifle. Marlin 30, 30A, 30AS, 36, 36A, 336, 336A, 336C, 336CS, 336T, 336TS, 1893, 1894, 1894S, 25MB. Mossberg 472SC, 479PCA, 479PCA, 479RR, 679. Navy arms 66 yellow boy, Model 73 Winchester. Remington 76 pump; Rossi lever action L38, L44. Ruger Impact Max .22 Pellet Air Rifle. Winchester 64, 94 series, big bore 94, 63, 1886, 1892, Model 9410.